Vacation rental house. Sleeps 9, 4 bedrooms, 3.5 bathrooms. No pets allowed. Welcome to Honu O Kai (Turtle of the Sea). 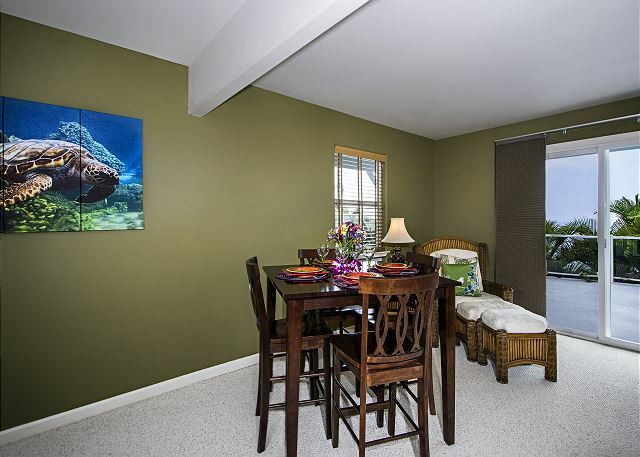 Just two miles from the ocean, makes this spacious, four bedroom home one of the best places to stay on the Big Island. 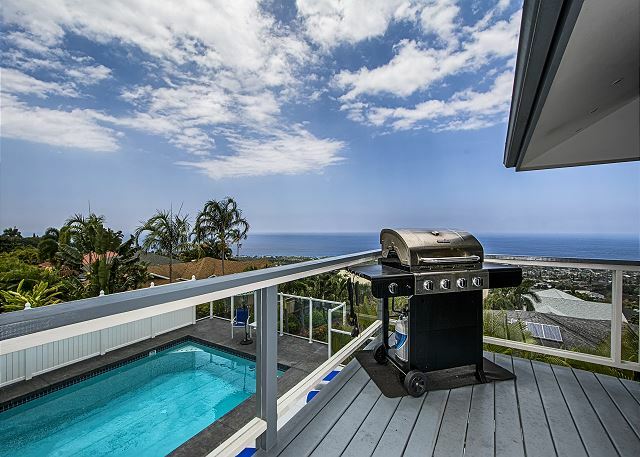 This two level home offers wide open spaces, two kitchens, both big enough for all your cooking creations, an 8’ deep private heated pool with an outdoor shower, spacious lanais, and a cozy living room that has ocean views from the comfort of your couch. 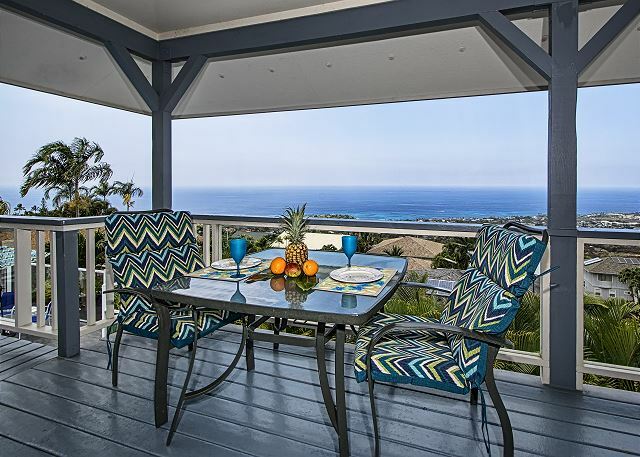 Located at a 700 ft elevation it provides comfortable trade wind breezes. The master bedroom and back bedrooms are both equipped with wall unit air conditioners for your comfort. The home backs up to a large vacant property which translates to peace and quiet and is hands down one of the best places to stay on the Big Island after a day of exploring! Honu O' Kai is conveniently located, a great home base to explore the many wonders of the Big Island of Hawaii including the Volcano National Park, Mauna Kea Observatory, coffee and macadamia nut farms, artist communities, and more! Best view, great location, so much offered, spacious and the pool is a nice option for families when away from beaches. Mahalo nui loa, for your 5 star review of Honu O Kai! The view from this property is indeed one of the best! We hope to have you stay with us again and can take advantage of our repeat client discount. This house was a perfect place to celebrate our 50th wedding anniversary with our family. The house was large enough to give plenty of space to the 3 families and the view was spectacular. The neighborhood is very quiet, in fact I think the young grandchildren probably woke up the neighbors when they wanted to be in the pool at 7:30 in the morning! Didn't get any complaints though! The house was comfortable, spotlessly clean and exactly as pictured. We had a wonderful experience. And the 4th of July fireworks viewed from the upstairs deck were fabulous. We are so happy to hear you had a wonderful 50th Wedding Anniversary here with your family and thank you for the 5 star review of your experience at the property! We sincerely hope to see you and your family again soon. Simply remember that the best possible rates are found directly through Boundless Hawaii. Mahalo! 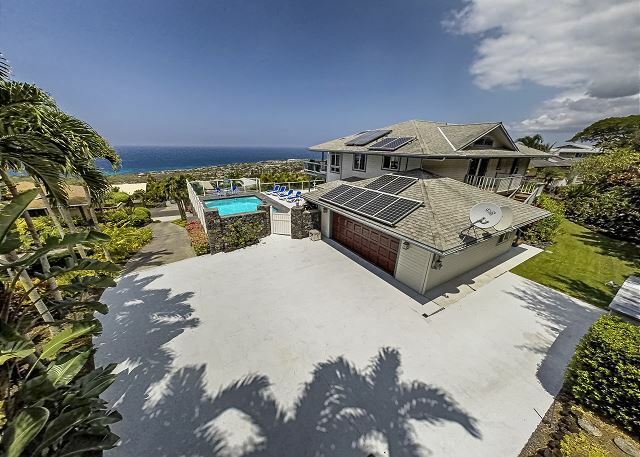 This home is well situated for excellent views of the Kona coastline! Most of our family started their day gathered on the deck talking, eating, and enjoying the beautiful weather and views! The home's pool was another gathering spot after long days of touring the Island! The home itself is beautifully decorated with large, open spaces inside as well as many well landscaped and designed spaces outside in the yard and on the decks! The pictures are an accurate representation of this home and I would highly recommend it as a place to stay in Kona! Honu O kai was the perfect rental. The house has a real nice layout with three bedrooms and a small entertaining room downstairs and the master bedroom, main kitchen and great room upstairs. 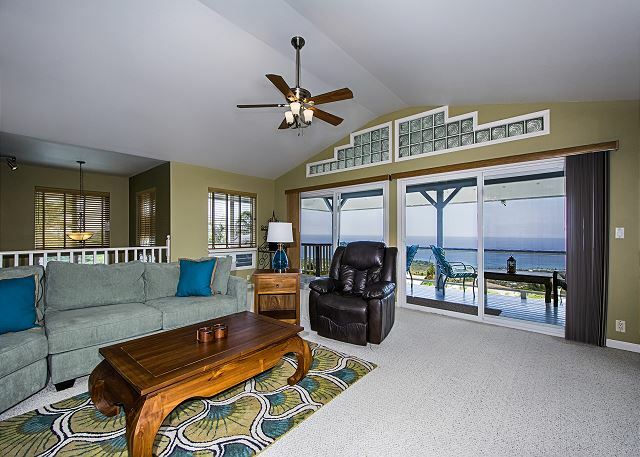 There is a great wrap around deck off the great room upstairs with 180 degree views of the ocean. The deck has ample seating and a BBQ. The house was clean and well equipped. The pool and deck area are large and well thought out. We thank you Jeff for the impactful review of your stay with Boundless Hawaii! We encourage you to book directly with Boundless Hawaii in the future, for the best possible pricing. Turtle of the Sea was the perfect house for our groups vacation. We had a total of 9 people 6 adults and 3 children under the age of 12. The view from the house is perfect, it was a great way to wrap up a day at the beach by coming back and watching the sunset from the balcony. The house was clean and actually has 2 living rooms and 2 kitchens. It was a 5 min drive to the nearest beach as well as shopping. I would absolutely stay here again! Wish I had more vacation time! Mahalo for the positive review! We hope to provide future accommodations for you! Perfect location with lots of room for the whole family! Well equipped house with lots pool toys, snorkeling gear and beach chairs. Pool was clean and well maintained. View was outstanding. Wild pigs in forest behind were nice to watch. Deanna, we are happy to hear you've enjoyed your stay at Honu O' Kai! We encourage you to contact Boundless Hawaii at for all future stays on the Big Island! Deanna, we are happy to hear you've enjoyed your stay at Honu O' Kai! We encourage you to contact Boundless Hawaii for all future stays on the Big Island! We had 7 in our party. My husband and I stayed in the spacious upper bedroom and the others were downstairs. Our son had a comfortable room to himself; our daughter and her husband had an equally comfy room; and the grandsons stayed in the room with twin beds. The upstairs deck is fabulous for sunsets and ocean view, and the living room was roomy enough for all of us. The pool was excellent, and with an ocean view. We appreciated the snorkel and swimming gear. The driveway was a bit of a shock, but we made it in our 7-passanger van with no problem. 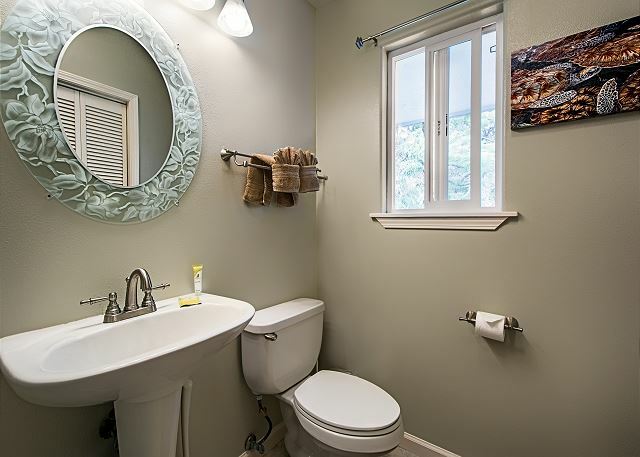 We're happy to hear the home was perfect for your party of seven! The driveway is step, however it is the sole reason the home has unobstructed views of the Kona coastline. We'd love it if you returned next year for another enjoyable trip to Kona! This place was spacious, well decorated, and very clean. There were several bedrooms with different layouts that accommodated our group (6 adults and 2 toddlers) well. It truly felt like a home away from home and I highly recommend staying here. We are happy to hear your stay with us was perfect for your family visit! We look forward to your inevitable return! We had 8 people and had plenty of space to spread out and relax. Mahalo for your review. 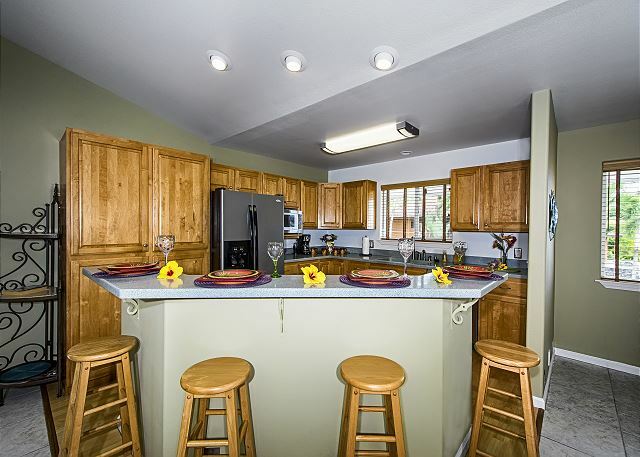 This house is ideal for groups and we would be happy to host your party for your next escape to Kona! Property was just as described, even more lovely than the photos. 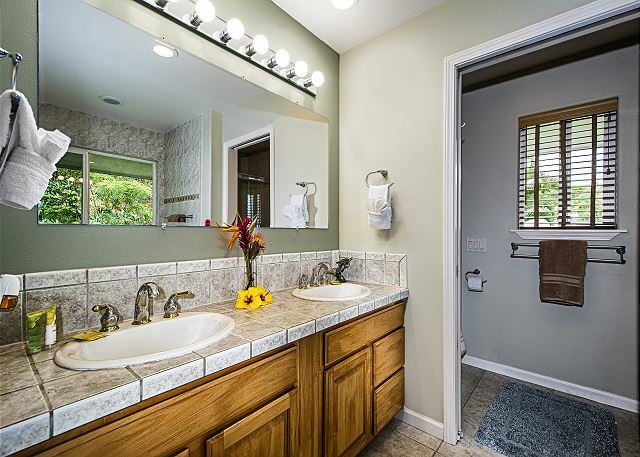 The bedrooms and baths were perfect to accommodate three couples and three kids. We watched the sunset every night from the upstairs lanai--beautiful! We liked being up above the town--a lot quieter than Ali'i drive. It was a great spot to launch our explorations of the various beaches to the north and south of Kona. The managers were very responsive and kind to give us a code to enter the house an hour early when we arrived. I would definitely recommend this property. Thanks for a great stay! Aloha and thank you for your review. We would be happy to welcome you back anytime! Please let us know if you return to Kona and we would be happy to extend a 10% discount to you as a returning guest. We had a great time at Honu O Kai. It had everything we needed as far as towels, utensils, et cetera. Aloha and thank you for your review! We would love to welcome you back to Kona. Please let us know when you plan to return and we would be happy to extend a 10% discount to as a returning guest. We had a great time sightseeing, snorkeling and enjoying family. The property was very nice but to be perfectly honest if you had more than 2 cars you would have to park at the bottom of the driveway and it is very steep. This was not a problem for us as we had 2 cars. The light and fan switches were all labeled which was very helpful. I also was very pleased with Boundless Hawaii :-) We will likely go to this property in the future it was really nice size for the 5 adults and 1 child we had. Aloha and thank you for the review. We are happy that you enjoyed your visit at Honu O'Kai. We would be happy to host you for your next visit. Remember, returning guests who book directly through Boundless Hawaii will be eligible for a 10% discount! Perfect location. Close enough to everything yet far enough away so it was quiet. Needed a place to stay for 4 couples as we were celebrating 3 of the wives' birthdays. This location handled our large group with ease. 2 kitchens, pool, lanai with view and bbq and close to town. What more could you ask for. We even had 3 rental cars with space to park all 3! The house was comfortable for our family but the views were exceptional!!! We wish we never have to leave at all!! Our family (4 couples) had an outstanding stay. 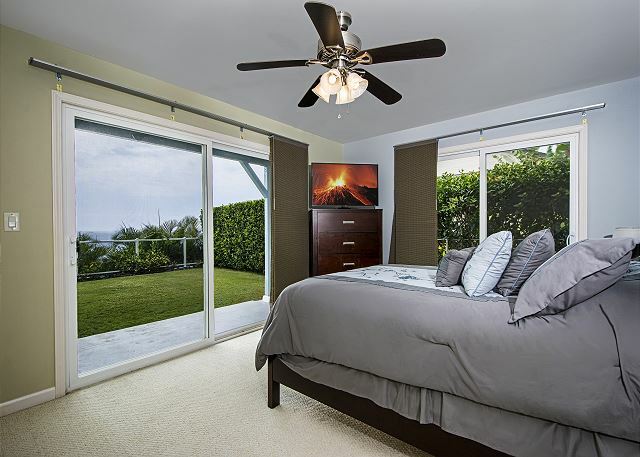 We found the home to match the advertised details, clean, excellent customer serve with Boundless Hawaii, and located in a quiet neighborhood. 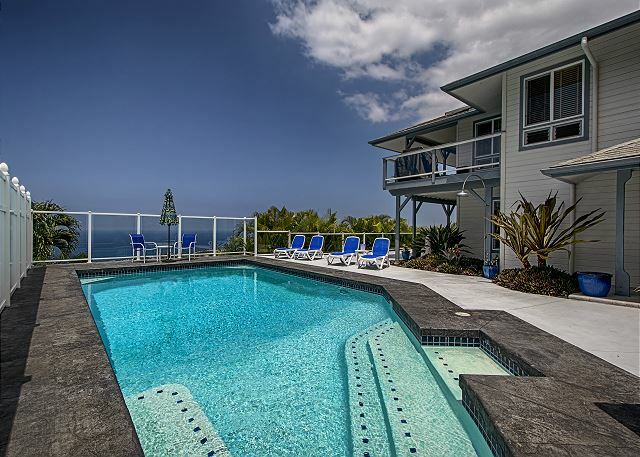 The outstanding view of the Pacific, the pool, and overall comfort of the home made it difficult to leave each day to see the other sights of the Big Island. We did find a few maintenance issues which we addressed with Boundless Hawaii. We spent Christmas 2015 at Honu O Kai with our 4 sons and their families, and this house worked out great for us. Having all of the space, bathrooms, and the wonderful pool gave us enough privacy to be together for an extended period of time. We particularly liked the fact that if we didn't want to leave Honu O Kai for the day that we could enjoy the views, the pool, and the sunshine right at home. We found the home to be clean, well cared for, and the perfect spot for our large family to use as a base for Big Island excursions. We particularly liked the privacy that we felt with no homes behind us. The management made this an easy stay! We showed up from the airport and began our stay, and didn't need to have anything done except garbage pick up (which happened at lightning speed when we asked for it) during our time at Honu O Kai. As a matter of fact we really had no need of any contact with the property management team except for the garbage during the entire 2 week stay. If you plan to drive on the Big Island I recommend getting a Costco membership. We saved 60 cents per gallon buying fuel at Costco. Since we drove to the North end, to Volcano NP, to the South end, to Hilo, and virtually everywhere else on the island we saved a ton on our fuel costs by becoming members at Costco. In addition we saved on steaks, burgers, and chicken that we were able to grill at Honu O Kai and have some great family dinners watching the sunset on the Pacific Ocean! We had a great stay at Honu O Kai - I cannot see staying anywhere else on the Big Island!